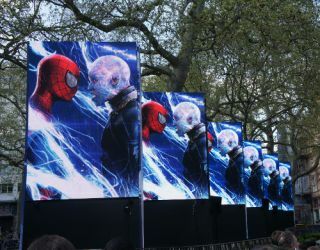 London’s Leicester Square was chosen as the venue for the world premiere of The Amazing Spider-Man 2 – the latest installment of the Marvel Comics franchise from Columbia Pictures. The premiere was attended by the stars of the movie including Andrew Garfield, Emma Stone, Jamie Foxx and Dane DeHaan. For the red carpet exterior of the cinema, XL Video was brought in to provide a video solution including multiple LED screens and media control. XL Video’s Project Manager, Mark Rooney selected the company’s new MC-7 LED, which displayed the logos and character images from the film. XL’s crew of Gary Burchett, Steven Grinceri, Rob Smith, Colin Mudd, and Fabrizio Di Lelio worked closely with the Layher riggers, cladding company and production team to construct the 6 LED displays. XL Video’s 2 x 2 touring frames ensured that the screens were built in around 30 minutes each.